StenoKnight CART Blog: Stump the Stenographer at the AMPHL Conference and Win! Stump the Stenographer at the AMPHL Conference and Win! 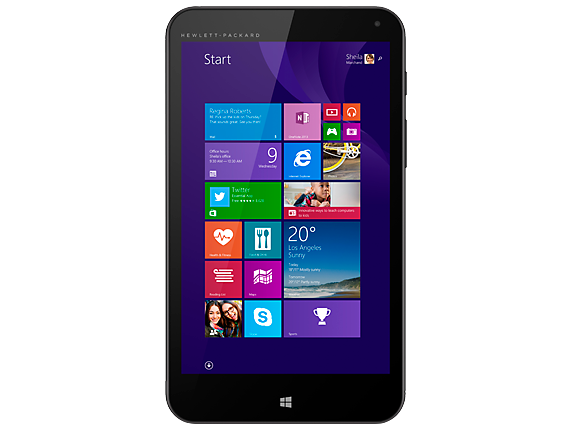 I'm going to be representing White Coat Captioning at the Association for Medical Professionals with Hearing Loss conference in Ann Arbor on May 16th and 17th, and if you're going to be there, you'll have the chance to win an HP Stream 7 tablet running Windows 8.1. All you have to do is come by the White Coat Captioning table in the exhibit hall and speak, sign, cue, or write a medical word or phrase of your choice. I'll have my captioning equipment set up at the table. If I'm unable to replicate that phrase, correctly spelled, on my computer screen within a few seconds, a card with your email address on it will go in a jar. At the end of the day, I'll pick a card out of the jar at random (assuming anyone's managed to stump me), and that person will win the tablet. It's portable, lightweight and versatile; a perfect handheld device for displaying wireless captions, among many other things. I'll be streaming captions to one at the table, so you can see how cool and compact it is. To keep things fair, I'm going to give each person three chances to stump me. If I'm able to correctly write all three, tough luck. Your card won't go in the jar. If you stump me three times, you'll get three chances to win! So keep your textbooks handy, because I've got over seven years of experience captioning for Pharmacy, Medical, Dental, and Veterinary schools, plus several more years transcribing interviews for medical journals specializing in Ophthalmology, Hematology, Oncology, Hepatology, and Gastroenterology, among others. (A more complete list of subjects I've captioned or transcribed can be found here.) Hit me with your best shot! The experienced captioner is on the top. The inexperienced one is on the bottom. But I'm pretty sure you already figured that out. Some firms put captioners without any medical experience on high-stakes jobs, with disastrous results. 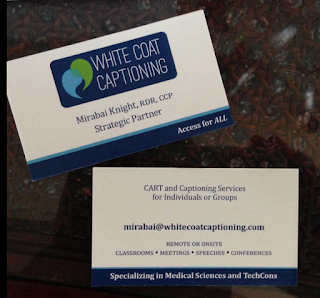 When you work with White Coat Captioning, you know that will never happen. See you in Ann Arbor! Where in Ann Arbor or at U of M will this be? Hi! The conference will be held at the University of Michigan hospital. Thanks! I CART for U of M nursing students and haven't heard of this. I will pass the info along. I may even attend.